On the day when former President Martinelli’s investigation limit ploy was unanimously crushed in the high court, this was the crowd that he could scrape together for a Colon protest against President Varela. 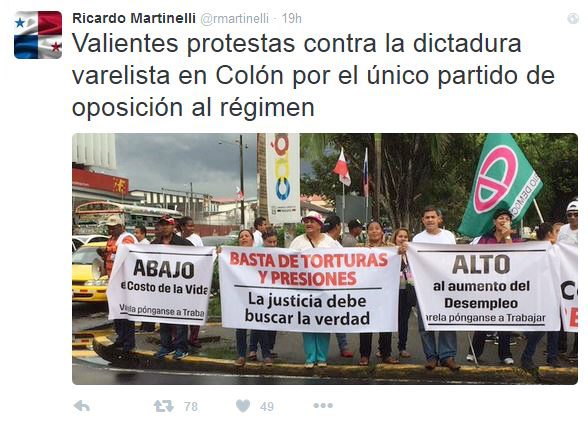 From Ricardo Martinelli’s Twitter feed. On November 19 the Supreme Court released a unanimous decision striking down a single challenged section of a 2012 law designed to protect Ricardo Martinelli and members of his legislative caucus from prosecution for crimes that they were about to commit. Article 491-A of Law 55 of 2012 provided that people with legislative immunity — including members of the Central American Parliament, as Ricardo Martinelli is by virtue of having been president of Panama — could only have criminal charges against them investigated during a two-month window of time after their immunity from investigation and prosecution is lifted. The Martinelli administration was in many respects organized and managed in ways similar to a La Cosa Nostra operation. In its lame duck weeks many paper and electronic trails were erased. Corrupted public officials blocked meaningful investigations — some still do. But too many people knew and there were copies of incriminating documents in too many places. Among the many rackets in which Martinelli and his associates participated the central crime was that they systematically rigged contracts, going around bidding procedures to make overpriced government contracts, with the proceeds of the bonanza split among the business owners and public officials involved but a large portion reserved for the purchase of gifts to shower on voters in order to buy the 2014 elections. The big deviant from the Cosa Nostra rule of omerta (silence) was legislator Sergio Gálvez, the self-proclaimed “Sexual Buffalo.” In 2012 there was a by-election for representante in Los Santos, in the El Bebedero corregimiento of Tonosi. Building materials, domestic appliances, cash and other valuables were passed out by the Martinelista candidate and by public officials of the parties supporting Martinelli, on a massive scale for such a tiny electorate. There was a denial from the Martinelli camp that public resources were used. What happened was that a small-time construction guy who got very rich from overpriced no-bid highway contracts with the Martinelli administration was the “private donor.” It was held by the Electoral Tribunal that in reality these were public funds. But Gálvez proclaimed that El Bebedero was the model for the 2014 elections, and that “he who doesn’t give doesn’t go.” Indeed it was the model of the 2014 Martinelista campaign, and Gálvez just lost his immunity from criminal prosecution for allegations of such conduct on his part. The Martinelli plan was vast and complex criminal enterprises that could not be investigated in just two months, hence that “reform” to the Code of Criminal Procedure. In the case that brought about the November 19 ruling, it was overpriced purchases of dehydrated foods for the school lunch programs. The case has been developing for more than one year against people who don’t have legislative immunity, but as to the former president the high court sued before the Electoral Tribunal to lift his immunity this past January 28, the day he fled Panama. It took a while to resolve that matter with the Electoral Tribunal, with Martinelli’s lawyers interposing all sorts delaying tactics, so the court didn’t get around to appointing an investigating prosecutor — Magistrate Oydén Ortega — until May 4. On July 2, just before the two-month window for investigations was to close, Ortega sued before his colleagues to have Article 491-A declared unconstitutional. In addition to Ricardo Martinelli, there are a number of legislators facing or about to face criminal charges in the Supreme Court. This ruling takes away their best hopes of running out the calendar to avoid being held to account for the things that they did. As a skeptical law professor Miguel Antonio Bernal points out, this was but one section of a nefarious law, and meanwhile the National Assembly took a proposal by President Varela to repeal the whole thing and instead — over a presidential veto — repealed parts of Law 55 of 2012 but added new privileges and immunities for public officials facing corruption charges. Varela has sued to get sections of the new law declared unconstitutional on much the same grounds as Ortega sued to overturn Article 491-A. Over Ortega’s objection, his colleagues have appointed Ortega to write the decision on Varela’s lawsuit. This particular embezzlement investigation directed against Ricardo Martinelli will now proceed.